Those who've invested solely in the stock market during the past several years have seen the value of their portfolios increase. As of June 30, 2017, the average 401(k) balance stood at $97,700, according to Fortune magazine. That was a 9.6% increase from a year earlier. Average IRA balances were even higher at $100,200. This belief in the continuation of the trend is noteworthy, given the fact that the bull market has lasted for nine years, and no bull market in history has lasted longer than 10. Yet, at the same time, those headlines are not at all surprising. Why not? Well, it boils down to two words: linear forecasting. Humans possess an ever-present, unconscious illusion that whatever trends and conditions currently in existence will persist. That illusion is the basis of all linear forecasting, which is to say virtually all forecasting. Elliotticians are different. We anticipate change. The way "we anticipate change" in social actions, including the stock market, is via the Elliott wave model. Students of Elliott Wave Principle by Frost and Prechter will recall this observation anticipating what could happen at the end of Supercycle wave (V): "If there is a throw-over, the ensuing reaction could be breathtakingly fast." Neither the experts nor the investing public is making any allowance for this potential. Keep in mind that this statement was made as of the close on February 1. 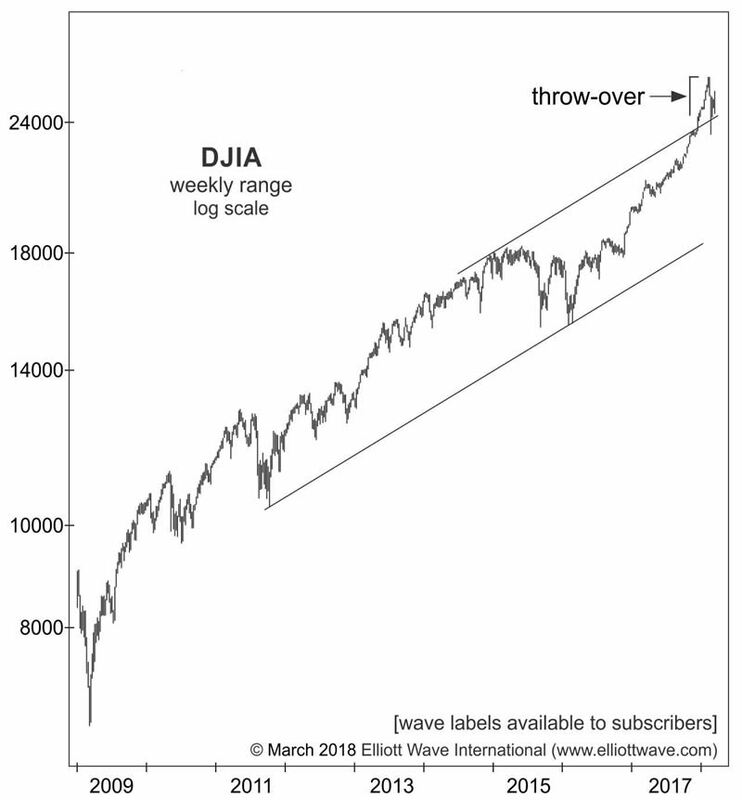 As you can tell on the chart below [wave labels available to subscribers], which is from our March 2018 Financial Forecast, the Dow Jones Industrial Average plunged 11% over the next six trading days. The "throw-over" had indeed been confirmed. Now is the time to find out what our Elliott wave experts are anticipating next for the stock market. This article was syndicated by Elliott Wave International and was originally published under the headline This "Illusion" Can Destroy Once-Vibrant Portfolios. EWI is the world's largest market forecasting firm. Its staff of full-time analysts led by Chartered Market Technician Robert Prechter provides 24-hour-a-day market analysis to institutional and private investors around the world.